"Screensaver" that shrinks the images to fit to the width or height of the screen, and scrolls to show the rest. Show and copy the RRGGBB color under the cursor. Copies user defined times and dates to the Clipboard. Displays the current date and time in the active titlebar. 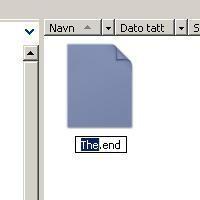 Unselect the file type when renaming files in XP. Logs the time spent on different tasks. Locks the computer in user defined intervals. Shows the current time in the start button,. Allow only one instance of a program to run. Prompts for a description when a shortcut is created. Creates and collects shortcuts to programs in a folder. Get easy access to your Screamer Radio stations, schedule recordings and lose the alert dialogs. Screensaver that runs a command. Remove prefixed creation date from favorites. Change screensaver every x minutes. Pause a program and run other programs before and after. Post you clipboard contents to PasteBin.com and return the URL. Puts a window on top of all others. Own a laptop with a mousepad? NoStrayClicks prevents stray clicks on the mousepad when editing documents. Keeps the PC from falling asleep by sending it keystrokes. Mutes or unmutes the speaker. Watch and control multiple monitors. Make rules to move files automatically. Shows the current time next to the mouse cursor, and date and more in the tray. Screensaver that turn off the screen. Turns off the monitor at user defined idle times during the day. Toggles the microphone's input volume between 0% and 100%. Maxthon plugin or Internet Explorer bookmarklet that opens all linked movies and pictures in the same page, and adds easy image viewing. Upload current IP address to a FTP server. Ejects all or some CD trays. Enables drag and drop of files to a command window in Vista. Press the windows key to lock the mouse movement along one axis. Download a file from the internet, and run it or open it in a program. Startup tool that will delete user defined folders unless the right password is entered. Screensaver that dims the screen. Detach embedded videos from your tabbed browser and show them in a window of their own. Give the desktop it's own taskbar button. Click it, Alt-Tab to it, or drag files to it to show or hide the desktop. List and delete empty folders. Closes all or some CD trays. Obtain or change a window's title. Ever hit caps lock by accident and not found out until half a page later? 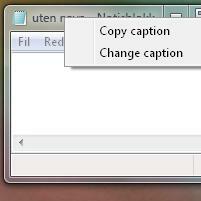 CAPshift extends the Caps Lock key by slowing it down, and shows a menu to change the selected text to lowercase, UPPERCASE, TitleCase, iNVERTEDcASE, RaNDoMCaSE or to Replace user defined characters. Add toolbars to your favorite programs. Replaces text as you type with any formatted text, image or other clip. Press a key three times or more to apply accents. Prefix favorites with creation date. Sends Alt-Tab when the mouse is on the left edge of the screen.